The Supreme Court on Monday sought the Centre’s response on pleas made by several state governments, to review its verdict banning the publication of photographs of Governors, Political Leaders and Chief Ministers from government advertisements. A Bench of Justice Ranjan Gogoi and Justice Pinaki Chandra Ghose, while issuing notice, directed the hearing of the matter on October 13. Apart from the centre, the Bench also issued notice to the NGOs Common Cause and Centre for Public Interest Litigation (CPIL) on a plea by Tamil Nadu, Karnataka, Assam and West Bengal seeking recall of the earlier order. The Bench, after considering the matter in the chamber on September 9, had decided to hear it in the open court on Monday. On 13 May, the Apex Court had ruled that government advertisements should not carry pictures of anyone other than the President, Prime Minister and the Chief Justice of India. The court had said the objective of the advertisement could be arrived at without a photograph, and asked the government to ensure public funds were utilised in an appropriate manner. The Apex Court said such photos divert attention from the policy of the Government, unnecessarily associate an individual with a Government project and pave the way for cultivating a “personality cult”. The May 13 verdict had come on the petitions by NGOs Common Cause and the CPIL, which had sought directions to restrain the Central and State Governments from using public funds on government advertisements that were primarily intended to project individual functionaries of the government or the party in power. The Judgment by a Bench of Justices Ranjan Gogoi and N.V. Ramana had come on the basis of a series of recommendations given by a committee led by noted legal academician N.S. 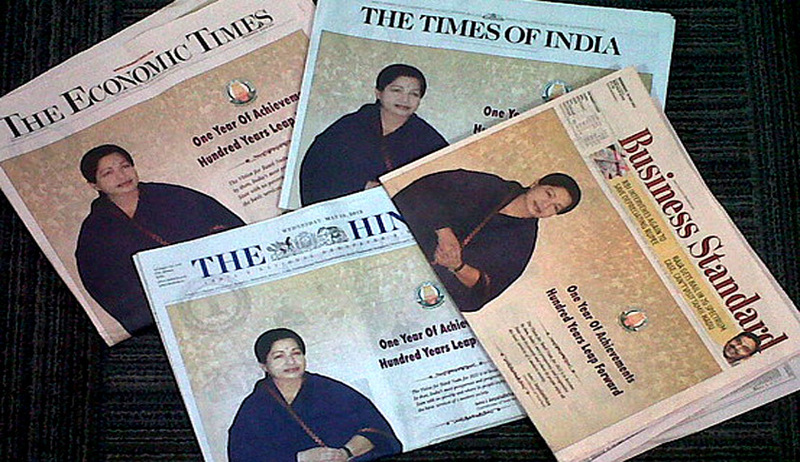 Madhava Menon on introducing checks on government-funded ads. The states have now sought parity in view of the federal nature of India, which puts state chief minister and governor at the same position as the Prime Minister and President of the country. Read more LiveLaw coverage on Government Advertisements here.